MONTREAL - It was party time in the Olympic Stadium grandstands and in the Toronto Blue Jays batting order. 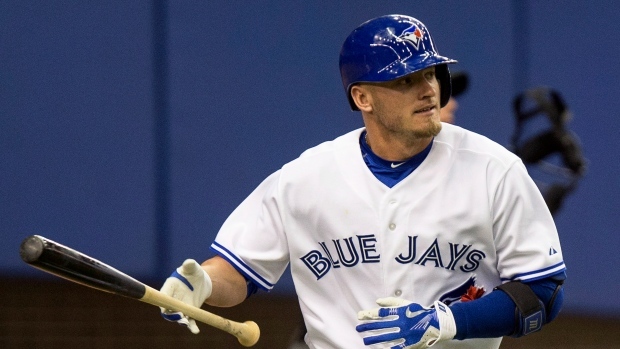 Playing before 50,231 in the domed stadium, Josh Donaldson homered to lead a 15-hit Toronto attack as the Blue Jays downed the Cincinnati Reds 9-1 in their final pre-season game on Saturday afternoon. "It's a really cool experience," said Toronto starter Daniel Norris. "And it's a good tune-up for what's to come." The Jays and Reds closed out their pre-season schedules by splitting a pair of games at the Big O that drew huge crowds as Montreal fans rallied to show Major League Baseball they want big league ball back after losing the Expos to Washington in 2004. With the 46,314 that saw the Reds' 2-0 win on Friday night, a total of 96,545 turned out for the games, up slightly from last year's 96,350 when Toronto played twice against the New York Mets. "We really enjoyed it last year and I think everyone was looking forward to coming back," said Blue Jays manager John Gibbons. "And the games are worthwhile because it's a lot like the season. "Big crowds. You get out of that hot sun in Florida and play some night games. I thought it was a big success and we appreciated it all." The Blue Jays open the regular season Monday against the Yankees in New York. A touching moment came at the start of the eighth inning when Jays catcher Russell Martin, who grew up in Montreal, saw his father come onto the field to take him out of the game instead of Gibbons. It drew a big reaction from the crowd. Russell Martin Sr., a musician, had played the national anthem on a saxophone on Friday night. "It was one of those moments," said Martin, who signed a five-year US$82 million deal in the off-season. "Already the week has been fantastic. "The big moment with the national anthem, and just being in Montreal. It's my dream coming to life really. Then my dad shows up on the field. That was a pretty cool moment." Another ovation came when Chad Wallach, the 23-year-old son of popular former Expos third baseman Tim Wallach, went in to pinch hit in the eighth. "It just showed me how popular my dad was here," said Wallach. "I know it was because of my dad but I really appreciated it. "I know they're trying to get baseball back and it's probably a huge help to get big crowds out here. If it's like that most nights, I think it would be a great place to play." Cincinnati's Bryson Smith drove in Chris Dominguez with a single in the ninth off Taylor Cole for the Reds, who were held to three hits. Otherwise, it was all Blue Jays at the plate. Donaldson hammered a 1-1 pitch over the wall in dead centre in the second inning. Jose Bautista doubled in Martin in the fourth. The Jays added four in the fifth off relievers Kevin Gregg and Chris Carpenter. Jose Reyes, Edwin Encarnacion, Donaldson and Dioner Navarro each drove in a run. Three more came in the sixth off Manny Parra with Justin Smoak, Steve Tolleson and Danny Valencia producing runs. Norris allowed three walks and no runs. Reds starter Anthony Desclafani went four, allowing two runs on three hits with three strikeouts. Notes: The Blue Jays decided on their last 25-man roster spot before the game, opting to keep Liam Hendricks and go with an eight-man bullpen and sending infielder Ryan Goins to triple-A Buffalo . . . Ex-Blue Jays manager Cito Gaston and infielder Roberto Alomar and former Montreal Expos star Tony Perez were honoured in a pre-game ceremony. ... Regina's Stu Sheruwater was home plate umpire.